My Dream, FOX's Nightmare ~ The Bucky Channel - The World of Sports from Wisconsin's Perspective. Living in Wisconsin, it's no surprise I am a die-hard Brewers fan. That one makes sense. 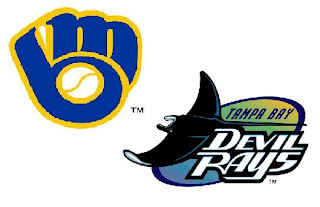 But for some inexplicable reason, I've also been a fan of the Tampa Bay (Devil) Rays for the past five years. I've made sure to let people know about my adoration for the Rays, so that if they were ever good, people would know I'm not just jumping on the bandwagon. Here we are now, in 2008, where the Brewers and the Rays have a legitimate chance to face each other in the World Series. I'd probably say the Rays have a better chance, since the Brewers are trying to eliminate themselves from contention recently. However, even though I would love this matchup to occur, Fox Sports CEO David Hill would not. WSJ: With the World Series a month away, are you worried about having to sell the country Tampa against Milwaukee? Mr. Hill: As a matter of fact, yes. [Laughs heartily.] You have no idea how many times that question has been asked of me in the last three or four days. But to be in this business you have to be an optimist. You're making huge bets and all you can change is the way you present the games. You can't impact what happens. You make big bets and you hope every game is a Patriots-Giants Super Bowl. But that doesn't mean you don't think how good the Red Sox and Dodgers in the World Series would be. But whatever it is we put the games on in the most compelling way so we can refresh the fan base every day. You can't lose sleep about what you can't control. I don't think you have to worry about this Mr. Hill. In case you haven't noticed, the Brewers are doing everything they can not to make this happen.